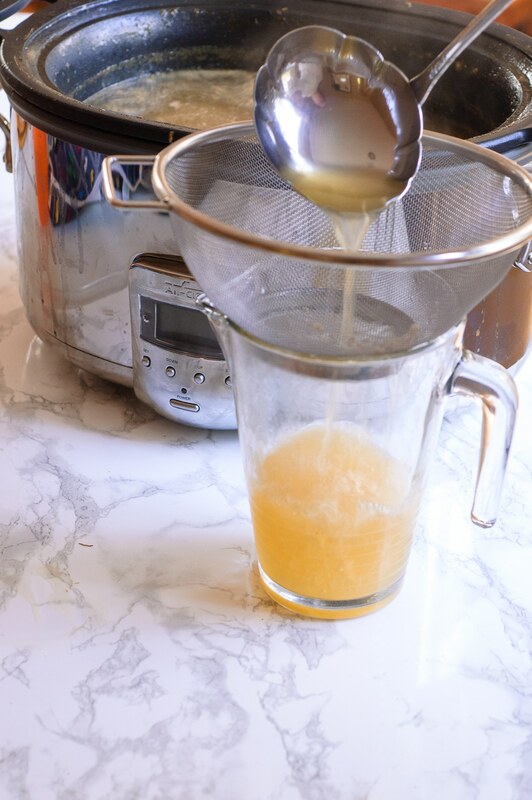 Homemade Turkey Stock / Turkey Broth in Your Slow Cooker - Done Overnight! Use your Thanksgiving leftovers completely and let this Overnight Slow Cooker Turkey Stock do the work while you’re sleeping. Use it to make soup or a delicious alternative to chicken broth! Note: This post was updated on October 16, 2018 with new content for your enjoyment. 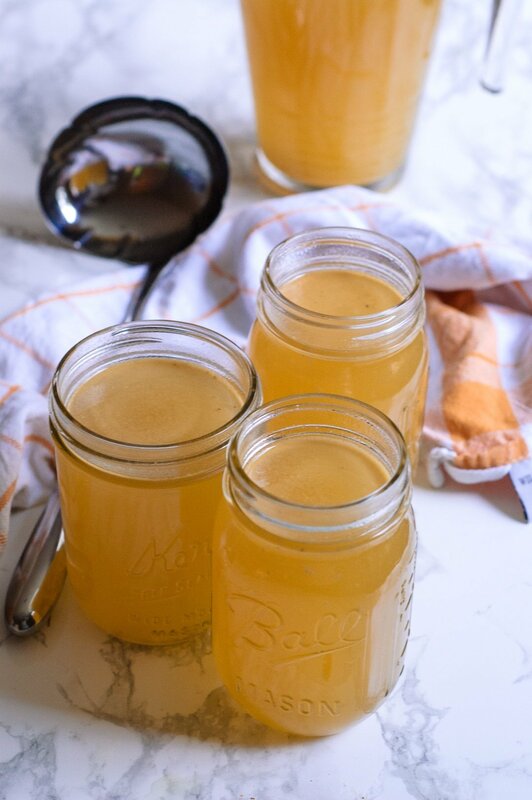 Homemade turkey stock is like pure gold, and it’s surprisingly simple to make. If you have a seemingly endless amount of Thanksgiving leftovers to contend with, this homemade stock is one of the best ways to help use them up. With only a few steps, you turn a turkey carcass into a delightful broth or stock that you can use in almost anything that calls for chicken broth. Your Crockpot or slow cooker does most of the work, but to extract every ounce of flavor from your overnight turkey stock here are some skills & techniques I recommend brushing up on. How to Roast Bones. Even though your turkey was already roasted, the bones themselves haven’t been. They need exposure to get the best flavor possible for your turkey stock. How to Make Stock Part 1. This is the beginning of a 5-part series on how to make homemade stock. Throughout the series, you’ll learn everything you need to know about how to get the best color, texture, and flavor from your stock. If you’re wondering things like “Why does turkey stock gel?” or “Why is my turkey broth cloudy?” This series will answer it! What is Mirepoix? Mirepoix is the vegetable foundation for making a good stock. Understanding it and it’s ratios will help develop the best flavor for your slow cooker turkey stock. Can I Freeze Turkey Stock? How Do I Store It? It’s important to take a minute to talk about proper cooling as this slow cooker turkey stock can become a breeding ground for food-borne illness rather quickly. Strain the stock through a fine meshed sieve directly into a heat safe container to cool. Place them immediately into an ice bath which will allow the turkey broth to cool in a safe way. Once strained and cooled, this turkey stock will keep in the refrigerator for five to seven days, and frozen turkey stock will stay good for up to three months. If you are freezing turkey stock, let it cool completely then divvy it into quart sized bags and freeze them flat so they take up less room in your freezer. Lemony Spring Vegetable and Couscous Soup. One Pan Chicken and Wild Mushroom Orzo. Cinnamon Rubbed Pomegranate Chicken Thighs. Pumpkin Cobbler with Parmesan Chive Biscuits. Once you read the recipe you may think “This isn’t really done overnight! I have to add stuff the next morning.” This is just a recommendation. The longer the vegetables and aromatics simmer, the more bitter the turkey stock becomes. By adding them in in the morning, you reduce the likelihood of them overpowering your turkey stock. If you would like to make the entire recipe overnight, add everything during the first step and let it simmer into greatness! 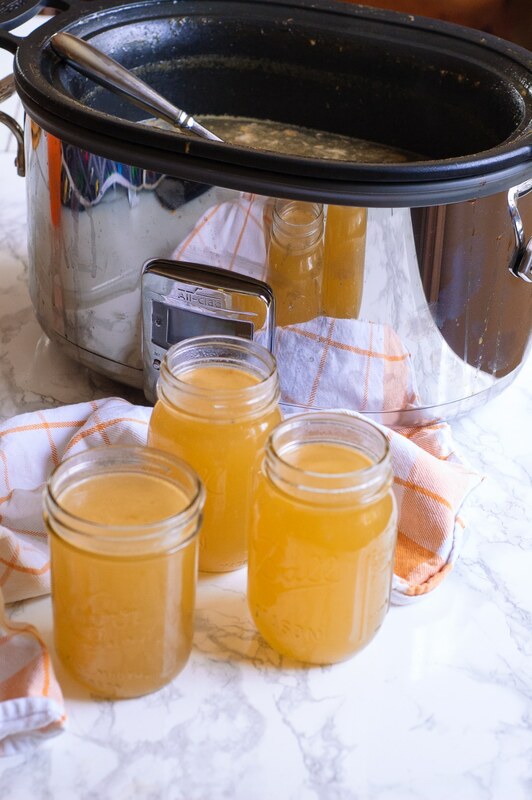 This overnight slow cooker turkey stock is a very hands-off way to get a delicious turkey broth from your Thanksgiving leftovers! Place the turkey carcass into a large slow cooker, fill the slow cooker with enough cold water to cover the bones (or until full) and select high for the heat. Set it to run for at least 8 Hours or overnight. The next morning add the onion, carrot, celery, garlic, fresh herbs, bay leaf, and whole peppercorns. Reduce the heat to low and simmer for an additional 4 Hours. Turn off the slow cooker and strain the turkey stock through a fine meshed sieve, discarding the solids. For better clarity, line the sieve with cheesecloth first. Cool in an ice bath and store in an airtight container or freeze. For better flavor, roast the bones after you've carved and serve the turkey. This will help give your turkey stock a deeper flavor. For more information about roasting bones, go here. For more space to fit your aromatics or get a better yield from your turkey stock, break down the turkey carcass before placing them in the slow cooker. This will make the bones takes up less space, as well as make it easier to fit the lid. That’s the way to go to make stock. No point leaving all that goodness without making it. Nice job. Thanks Mark. I love how easy it is to just set it and go. . .and not worrying about whether or not the burner will go off during the night! Good idea on using up all those turkey bones! Nothing beats a good stock! I love using a slow cooker for something like this! Me too, Michelle. It’s so nice to just walk away and not worry about it. Especially after a heavy cooking day like Thanksgiving. I seriously just printed this out to try! I have a whole turkey carcass in my fridge staring me down. I know I SHOULD make stock, but it’s so much work! Love the idea of letting my slow cooker do it for me. I am ashamed to admit but all too often I end up throwing the bones away rather than making them into stock. I have such good intentions but unfortunately rarely put them into practice. I know I should and I do think making the most of your slow cooker and letting it cook overnight is a great way to do it. I’ll just have to remember that next time I have a roast dinner! Thank you Valentina! And Happy Holidays to you! Hi Mackenzie! Thank you so much for such an informative and educational post. Your broth looks so clear. I never saved my turkey carcass before, but I did this time. I am totally going to try out this stock recipe. I bet it would be perfect for a turkey noodle soup or turkey pho! I’m so excited to hear you’ll be making stock this year! I love making stock in the slow cooker because it always has terrific clarity, and that comes from not being jostled around the pot during simmering the same way a burner does! This is amazing and very helpful idea to make stock with less work. Love the slow cooker. Thank you Sabrina. After a busy day making Thanksgiving, the last thing I want to do is stay over the stove all day making stock! I’m going to attempt turkey stock this year and this is exactly the kind of recipe I was looking for! That’s so great to hear Christine! I hope you love it! Definitely the way to go for turkey stock! Love to get every last delicious use from a turkey. Yes! It’s so useful even beyond the feast!